John Kasich attended a town hall-style meeting in Molly’s Tavern and Restaurant Tuesday in New Boston, N.H.
NEW BOSTON, N.H. — Just last week, Donald Trump was thundering at a rally at Concord High School, Ted Cruz was shaking hands at Lino’s Restaurant, Marco Rubio was gawking at pipes and fittings at a welding shop, and Bernie Sanders was decrying climate change in Wolfeboro. By Tuesday, the only candidate making any noise in New Hampshire was John Kasich, who spoke in front of a crackling fire at a cozy tavern in New Boston, a rural outpost by the foot of Crotched Mountain. The center of the political universe has shifted 1,250 miles west, to the flatlands of Iowa, where most of the Democratic and Republican candidates are fighting for an edge in the state’s potentially pivotal caucuses, which will be held Monday. The abrupt exodus to the Midwest has put a brief freeze on the frenzy of glad-handing by most of the candidates in New Hampshire. “I was telling people, if you want to see a candidate you had to go and see them last week,” said Fergus Cullen, a Kasich supporter and former chairman of the New Hampshire Republican Party. He noted somewhat ruefully that when the rest of the candidates return to New Hampshire next week, they will hold fewer intimate town-hall-style-meetings and more amped-up rallies and diner stops staged for the national media. Remaining in New Hampshire during the week before the Iowa Caucuses is rarely rewarded. “All good things must come to an end,” Cullen said. Iowa, meanwhile, turned into a blizzard of activity Tuesday. Cruz, chasing Trump for the lead in Iowa, was making seven stops across the state, trying to fire up his supporters with the help of two fellow conservatives, former Texas governor Rick Perry and Representative Steve King of Iowa. 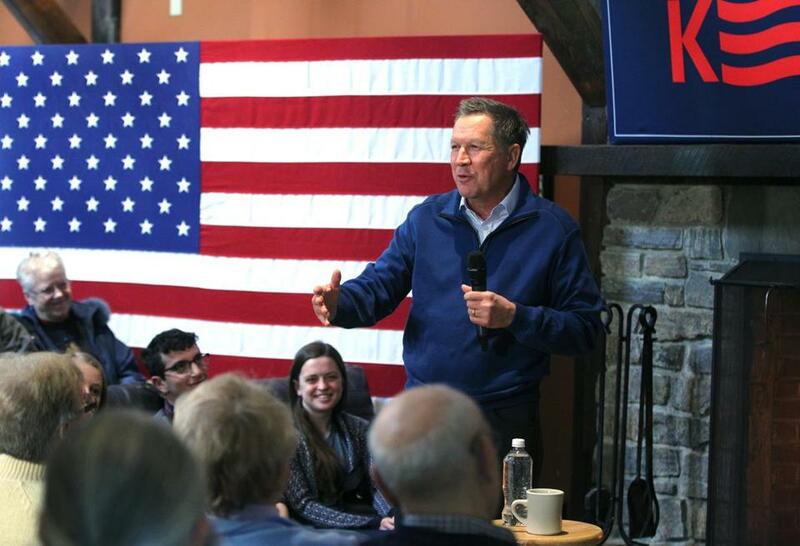 Kasich gestured Tuesday during a town hall-style meeting in New Boston. In Marshalltown, a long line of Trump supporters waited in snow flurries for the start of a rally with the bombastic New York real estate mogul, as vendors hawked “Make America Great Again” T-shirts and hats. Former secretary of state Hillary Clinton took a question in Decorah on whether she might nominate President Obama to the Supreme Court (“wow, what a great idea,” she said). Kasich, trailing in Iowa polls, said Tuesday that he plans to skip the caucuses and take advantage of the empty battlefield in New Hampshire, where many polls show him in third place behind Trump and Cruz. He said he will return to Iowa to attend the GOP debate on Thursday, and will then campaign in New Hampshire until the primary on Feb. 9. “This is a place I feel can give me the launch I need so people all around the country can at least hear my message,” Kasich said at Molly’s Tavern and Restaurant on Tuesday. 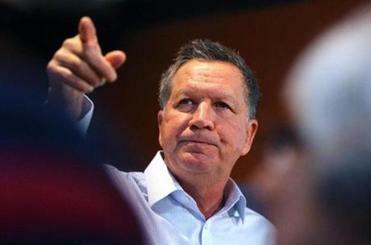 Kasich, the governor of Ohio, boasted he has held 78 town hall meetings in New Hampshire since he launched his presidential campaign in July. All told, he has made a total of 167 stops in New Hampshire — more than any other current Democratic or Republican candidate, according to a candidate-tracking website maintained by New England Cable News. “I’m just glad you don’t have an income tax here because I might qualify as a resident,” Kasich told the crowd at Molly’s Tavern. 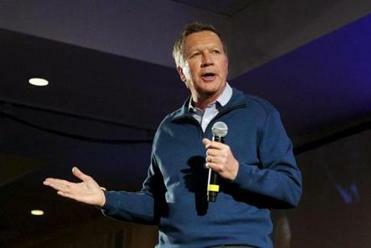 Kasich is among four candidates who are assiduously courting New Hampshire voters and attempting to emerge as the establishment alternative to Trump and Cruz. But unlike Kasich, the other three candidates — Rubio, Governor Chris Christie of New Jersey, and former Florida governor Jeb Bush — are also trying to remain competitive in Iowa and are campaigning there this week. Even when the candidates are out of state, their campaign operations — and their television advertisements — are ever-present. Their aides are preparing for the hours following the Iowa caucuses, when the political spotlight shifts back to New Hampshire for the eight-day sprint to the primary. In staking much of their fortunes on New Hampshire, Kasich and other Republicans are hoping to reprise the success of Senator John McCain in 2008. That year, he effectively ignored Iowa, campaigned doggedly in New Hampshire, won the primary over Mitt Romney, and eventually claimed the nomination. But history is also littered with candidates who banked on New Hampshire only to see their hopes dashed. Senator Lindsey Graham held 176 events in the state last year — more even than Kasich — according to NECN. But Graham never gained a following and dropped out of the race in December. In 2012, Jon Huntsman also campaigned almost exclusively in New Hampshire, but finished third and dropped out of the race five days later. And even a New Hampshire win doesn’t guarantee success. In 2000, McCain won the state’s primary but lost the nomination to George W. Bush. Kasich insisted he has built a national operation that can continue beyond New Hampshire to South Carolina and Nevada, which hold the next two contests in February. 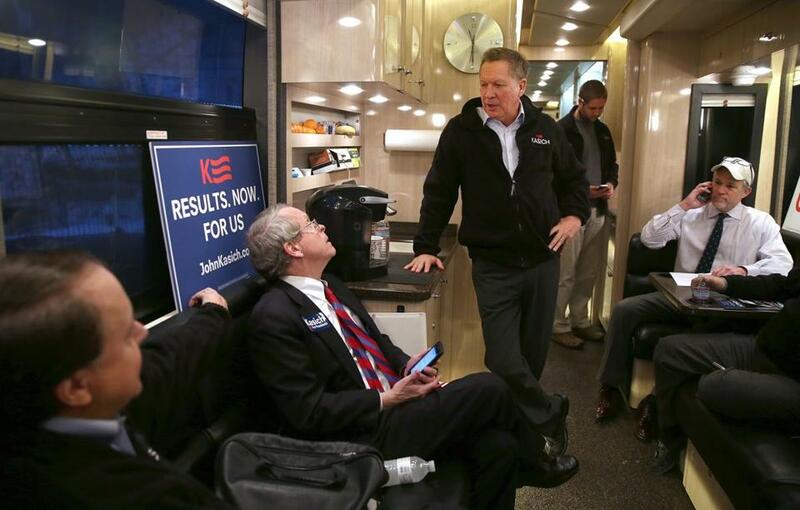 With Ohio attorney general Mike Dewine (second from left) aboard, John Kasich headed for another New Hampshire stop on his campaign bus Tuesday. Matt Viser of the Globe staff contributed to this report. Michael Levenson can be reached at mlevenson@globe.com. Follow him on Twitter @mlevenson.